A thought for a little town in Saskatchewan, from a little town in Colorado. Gunnison was a perfect place for me to find inclusion when I was a child. Gunnison was small. It had one stoplight. The next traffic lights were 60 miles away in either direction. (To the east, over Monarch Pass, in Salida, Colo., and to the west, up and over Cero Summit.) When I see old shows like The Wonder Years, I am reminded of the quiet, simple town that is Gunnison. Small town kids are expected to do it all. With such a small student body in the schools, the same kids that play sports are in the band. The same kids that organize the yearbook, star in the school play, comprise the debate team, and join the physics club. Everyone knows everyone, and a friend’s parents are your parents as well. This seemed normal to us, but as we left Gunnison to attend college or jobs away from home, we found our version of normal was a departure from most peoples’ experience. I recall, as a high school freshman at the official weigh-in for the fall football program, praying that I would break the 100-pound mark so I wouldn’t stand out as the little guy in the program. I’m not sure I did actually weigh 100 pounds, but I don’t think coaches wanted to admit to having a 90-some-pound kid on their roster. They probably fudged my weight just a little. On Sept. 11, 1971 I travelled with our eighth-grade football team to Olathe, Colo., to take on their team, The Pirates. I can’t remember many details about the game, but I think we lost. I do remember the ride home. Normally, after kids are accounted for, out of the locker room, and loaded on the bus, the coaches would load last and sit in front. We always thought they discussed the game they had just seen, but after my own coaching experiences as an adult, especially at the middle school level, I know this conversation could be random and cover the gamut. This time, the coaches were somber. Even I knew that the outcome of an eighth grade football game couldn’t make that deep an impact on their spirits. They had a clipboard out and were looking back through our faces throughout the ride home. It was odd. When we arrived back at school, the parking lot was full of cars. A normal scene today at any school, but given the size of our town, this was strange. Even though we left at 6 a.m., kids were seldom dropped off unless they lived out on area ranches. Instead, we rode our bikes from our houses and returned home the same way. But on this day, parents were waiting in their cars. They grabbed their kids and drove off without revelry or cheer. There was an odd feeling floating there. No locker room delivery of equipment, no picking up bikes. There had been a bus wreck that morning, she explained. The ninth-grade football team bus, travelling in the other direction from us to Salida, had crashed on Monarch Pass. She didn't have any concrete details. At home, our only source of information was rumour, and what was being broadcast on our local radio station. We sat glued, listening to the radio. I tried to call friends on the house line, but all circuits were busy. I recall finally just walking up the street to find my buddies, and find out whatever I could. There was no good news. Rumours flew about death and injury. It was several days before any reliable information was available. The bus lost control when the brakes burned out coming down Monarch Pass. The bus was almost down the pass when the driver swerved, trying to avoid hitting oncoming traffic. The bus and its passengers rolled two-and-half times off the highway. Eight students and one coach died in the crash. Many more sustained terrible injuries. There were no grief counsellors who appeared at our school in the following days and weeks. There were no missed days of school or forgiveness of schoolwork. Families were crushed, but life went on. In a small town, everyone knows everyone. The unthinkable had happened and the only thing to do was carry on. I think about that childhood disaster now and I am amazed how we swept things under the rug. We just did not really talk about it. It was not until two decades later that the jersey numbers of those that died were retired and put on display at Gunnison High School. The funeral for our fallen brothers was at the Western State College gym. They held the service as a team. The gym was the only building in town that had the capacity to hold the community. As it stood, there was not nearly enough room, and the crowd spilled into the lobby and out onto the grass in front of the building. This day stands out from the many memories of my childhood. We endured a dull ache for years. I felt particularly bad that day, not only for the parents, but also for those boys who survived the crash. Now we know that some kids exposed to that type of trauma might never fully recover. They potentially carry a host of negative emotions with them for the rest of their lives. That year and the next, our varsity team played with a vengeance. That all came to an end as the older classes graduated. Many of those who were injured in the wreck defied the odds and battled back through injury and grief to play in following seasons. I was included in team sports, which under normal circumstances had the bus wreck never happened, I would not have made the cut. There were several outstanding athletes in our class, but there were also many like me, who rose up due to the vacant positions. Without our lost and injured teammates, we took a beating for a few years. There was no mercy from our rival teams, forgetting that years after the accident, we were still reeling from our loss in more ways than we all understood. As a junior, I remember talking with a member of a dominant regional team that winter. He was quick to remind me how badly they had beaten us that fall. “Wow, great job.” I thought. The league and state had long forgotten our lost players. We had not. After a loss or two as seniors, we made the decision to change the culture of our team. We had been crushed by the rest of our league for a couple of years. It is easy to get used to losing if you’re not careful. A coaching change and fresh perspective righted the ship for us in terms of competing, but nothing replaced the friends that we lost. I was taken back to these feelings after losing teammates in a climbing accident on Everest. I was left wondering, among other things, why not me? 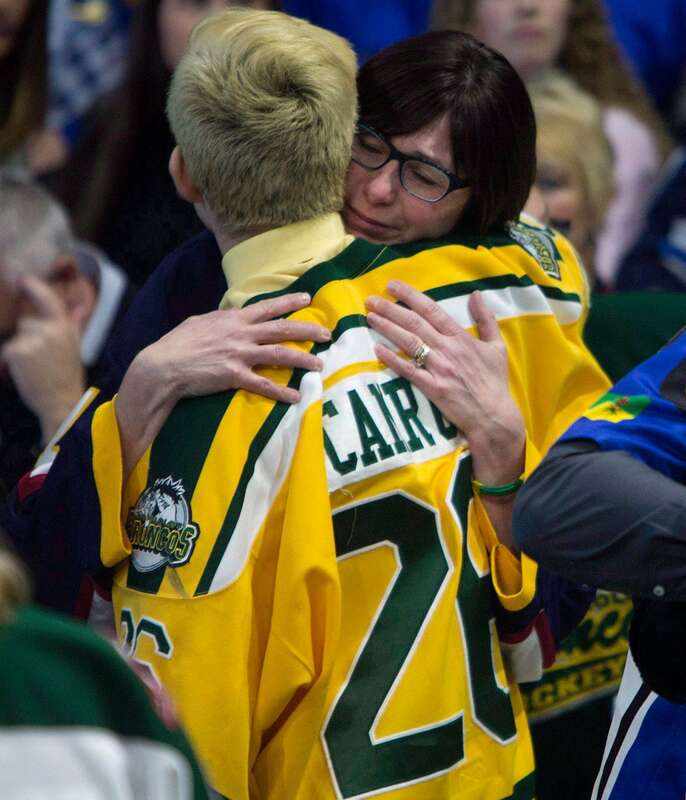 But as I think now about the people in Humboldt, whose grief is so fresh, I want to suggest a couple of things. To be honest, our bus wreck was more than four decades ago, and l still have the occasional pangs of anguish. It is still a topic of conversation among peers. For us, and for you l suspect, this tragedy will be forever woven into our fabric. And the grief is not reserved for those in the front row. There is a massive ripple. You don't have to be a direct survivor, family member, or parent to feel the horrible loss. As l recall, life became intensely painful for many of us after the cameras left, and articles ceased. The media moved on to the next thing, and we were left to pick up the pieces. lt hurt to realize that the world in general just continued to spin. Things tend to return to normal. Of course this is natural, but I just hated it. I wanted everyone to stay in the pain that our community felt. As much as we wanted to forget and move on, a part of me didn't want to lose the overwhelming feeling that l had - ever. For us kids, it was probably our first experience with tragedy. We learned quickly that there is no right way to act after a loss. We learned that a lot of the things we worried about in our lives were meaningless, and many conflicts with our peers were petty. It became clear that everyone has their own style of grieving, and you have to respect all of them. We learned that grief takes as long as it takes. We also learned that it was pointless to try to assign blame. We were all burdened with the thought, were all these deaths for nothing? It took years to realize, but the tragedy gave me the gift of going through life a little more softly, to be just a slightly better person. It made our community tight knit. Did we all magically align, and everyone become best friends? Well, no. But we did feel the unity that a tragedy ushers in, and we had a little more compassion for each other. All these years later we are still carrying the flag for our fallen brothers, as you will be too.